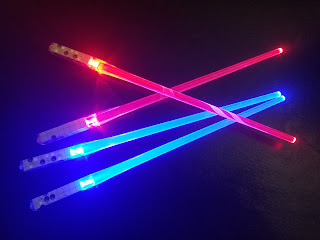 LED Light Up Lightsaber Chopsticks - Just $12.99 + FREE Shipping w/Prime! Wow! 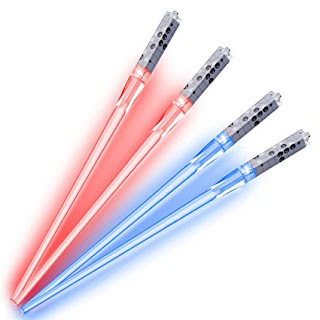 Check out these really cool LED Light Up Lightsaber Chopsticks for Only $12.99 + FREE Shipping w/Prime! EXTENSIVE DURABILITY: Our chopsticks are made of thick plastic material which are durable and easy to clean. These chopsticks are much more durable than bamboo chopsticks and have nice small swirly design and tapered end for easy food pickup. PERFECT DESIGN: On the top of these chopsticks we adopt passivizing treatment to avoid injuries, and thread design on upper part can make you hold them easier and more comfortable. It's ideal for any Asian-style dinner party, Sushi Night and any Asian features party. 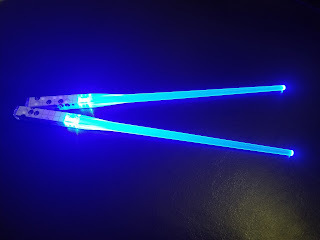 How many people can say they own their very own light saber chop sticks? 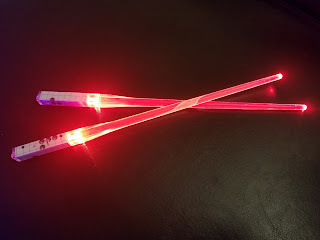 My teenage daughter has a part time job in a sushi restaurant and I thought these chop sticks would be a funny/cool gift for her. If you know someone who likes sushi and Star Wars you can't go wrong! There’s something satisfying about using a familiar and well-loved object rather than some impersonal plastic thing that doesn't even work properly. Our chopsticks are perfectly made with accurate design which makes eating easy with more fun. They are much more durable than bamboo chopsticks and have nice small swirly design and tapered end for easy food pickup. Our chopsticks is made of hardy material, a good length, really bright color and glowing led light. Our plastic chopsticks serve many new functions besides tableware. For example, you can buy a pair as a gift to your friends and relatives. A newly-married couple will be very happy to accept it as their wedding gift. Skillful and beautiful sceneries on the top of our chopsticks makes them like fine artworks. Many people love to collect them as their treasure.